Note: This post has been updated as of April 11, 2017 to include new recommendations. It doesn’t matter what you’ve heard. We happen to think that brunch is the most important meal of the day. You can reap the benefits of a hearty breakfast, choose a more lunchy item if you wish, sip on mimosas — and do all of this at the lazy hour of 11 a.m. (or later!) on a weekend. In order to experience this brunch phenomenon on a more regular basis, consult our list of the best brunch spots in and around Toledo. Most brunch menus are served on the weekends, but there are a few hidden gems that offer brunch on a daily basis! Saturdays & Sundays 10:30 a.m.–2:30 p.m.
You may not realize that one of your favorite coffee shops in town serves an absolutely killer brunch. 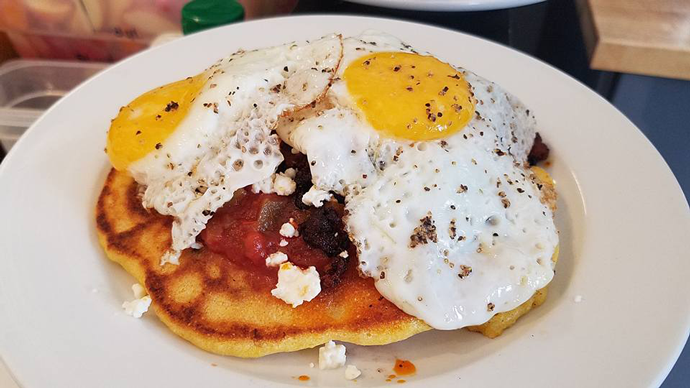 Black Kite Coffee and Pies’ chef Tracy Plumb-Ruiz crafts a delicious brunch menu each Saturday and Sunday that changes on a weekly basis, depending on the ingredients they source that are most local, fresh, and in season. Keep an eye on the Facebook page to see the new menu each week, where you’ll find creative, sweet and savory menu items sure to fulfill your brunch craving. If you’re looking for an on-the-go option before your weekend adventure, simply stop by Black Kite for a cup of coffee and a doughnut made by Holey Toledough. Monday through Saturday, 6 a.m.–3 p.m., Sunday 7 a.m.–3 p.m.
Reynolds Garden Cafe offers a stellar breakfast and lunch menu every day of the week (think: corned beef hash, smothered country fried steak, and sweet and savory crepes of every flavor imaginable). However, Sunday brunch is an event in itself. Come enjoy the friendly atmosphere and line up for a spectacular all-you-can-eat buffet filled to the brim with all of your brunchy favorites. Saturdays & Sundays 11 a.m.–3 p.m.
Bravo! Cucina Italiana’s brunch menu proves that Italians know their cuisine. Along with the usual brunch suspects (such as a Ham and Biscuit Benedict or a Vegetable Omelette), come some unique dishes, like their Sicilian Omelette or the Candied Bacon and Egg Burger. Head to the warm, comfortable and classy environment of Bravo! at Franklin Park Mall just before your weekend shopping adventure! 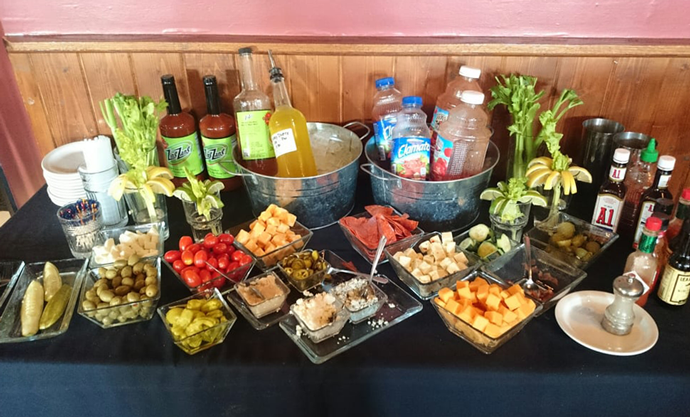 Turn Doc Watson’s breakfast menu into a brunch menu when you stop by on a Sunday for their Bloody Mary Bar from 11 a.m. to 3 p.m. Make your drink just the way you like it, using their house-infused vodka and unique ingredients like garlic, bacon and hot peppers! And better yet, you can order $4 Mimosas all day on Sundays. If you missed the weekday happy hour from 3–6 p.m. at Fire Pit Grille, return on Sunday between 10 a.m. and 3 p.m. for their special brunch buffet. This all-you-can-eat buffet includes chef-carved sirloin, smoked ham, BBQ chicken, roasted turkey, biscuits and gravy, omelettes, macaroni and cheese, and so much more. Get $2 off house Bloody Marys and Mimosas to complete your meal! The buffet costs $16.95 for adults, $7.95 for kids 10 and under, and kids under 3 eat free. While you can experience Glass City Cafe’s amazing breakfast selection any day of the week, if you time your visit to occur on Saturday, you’re in for something truly special. The cafe’s Bluegrass Breakfast features a special brunch menu and live music from 10 a.m. to 1 p.m. But keep in mind that doors open at 8 a.m. if you’re an early riser who just can’t wait for the excitement to begin! Stay up-to-date about their Bluegrass Breakfasts and other special events by checking their Facebook page for updates. 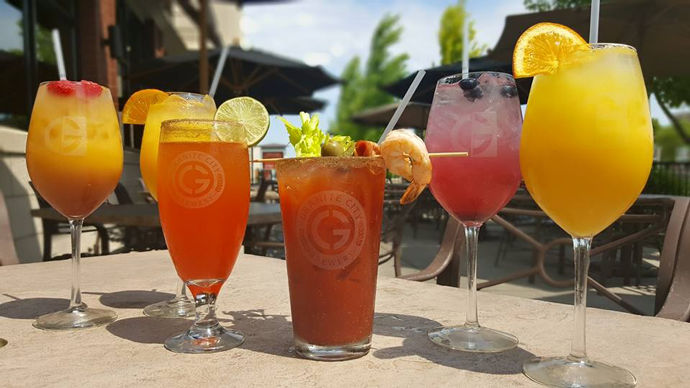 Sundays 10 a.m.– 2 p.m.
Fuel your shopping trip at the Shops at Fallen Timbers in Maumee with the brunch buffet at Granite City Food & Brewery. 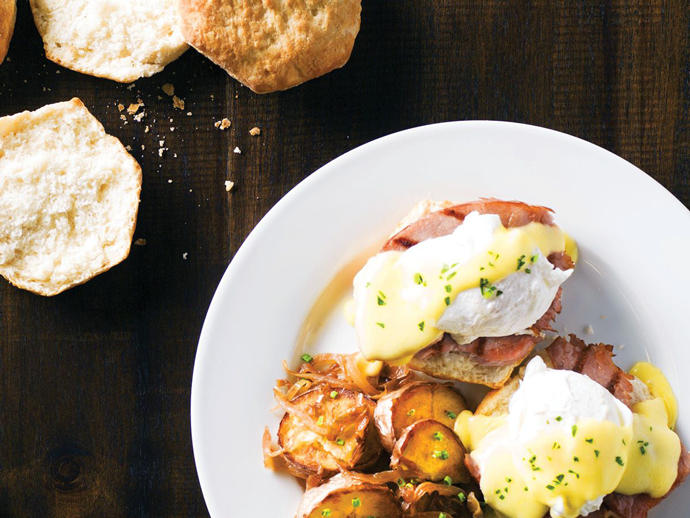 Their tasty selection features just about anything your heart — and taste buds — desire, including Granite City’s signature caramel rolls, smoked salmon, reggiano hashbrown potatoes, carved meats, build-your-own waffle and omelette stations, and so much more. Complement your selections with a special brunch cocktail, such as the signature Bloody Mary, or crafted mango, raspberry or blueberry Mimosas! Indulge in the all-you-can-eat buffet at Manhattan’s Pub ‘N Cheer each Sunday from 10 a.m. to 2 p.m. You’ll find a wide variety of breakfast and lunch items, including breakfast meats, cuts of fresh fish, quiche, an omelette and waffle station, and more. Plus, receive bottomless coffee and a complimentary Mimosa when you purchase the buffet for $16.95. What better place to grab a breakfast-centric meal than at a place that specializes in breakfast? 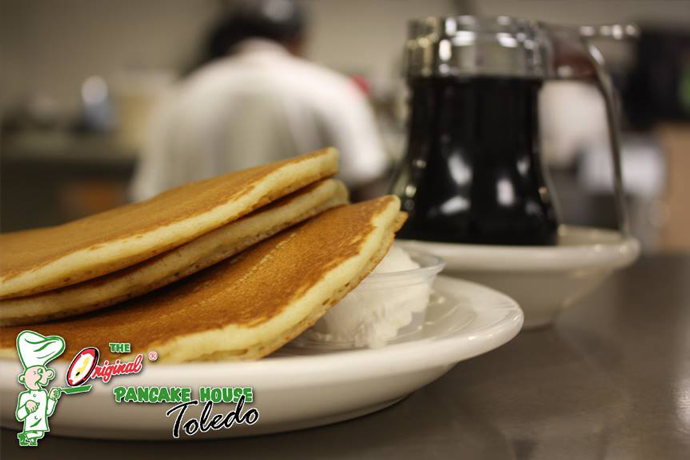 While The Original Pancake House at Westgate Village Shopping Center doesn’t have a specific brunch menu, you can create your own brunch experience by ordering some of the fluffy pancakes smothered in maple syrup, eggs Benedict, or a Belgian waffle. One of their favorite options from the menu is the biscuits with homemade sausage gravy, corned beef hash, and chili. Whatever you eat, you can guarantee it will be made with the freshest and finest quality ingredients available and created with the restaurant’s tested and approved recipes. Every Day 6:30 a.m.–3 p.m.
Scrambler’s is a local chain offering breakfast, brunch and lunch at its many locations throughout northwest Ohio and southeast Michigan. The simple brunch menu features delicious brunch wraps served with your choice of a side, and the restaurant’s famous skillets, which include your favorite ingredients on a bed of skin-on potato chunks topped with two basted eggs and your choice of bread. In addition to Ye Olde Durty Bird’s diverse and delectable menu, you’ll receive plenty of royal treatment each Sunday from 11 a.m. to 3 p.m. Create your own personalized drink at the Bloody Mary Bar, order a Mimosa, and dig into their famous Big Country Open Face Brunch Sandwich. Better yet, enjoy live music while you eat between 1 and 4 p.m. each Sunday! We’re curious. 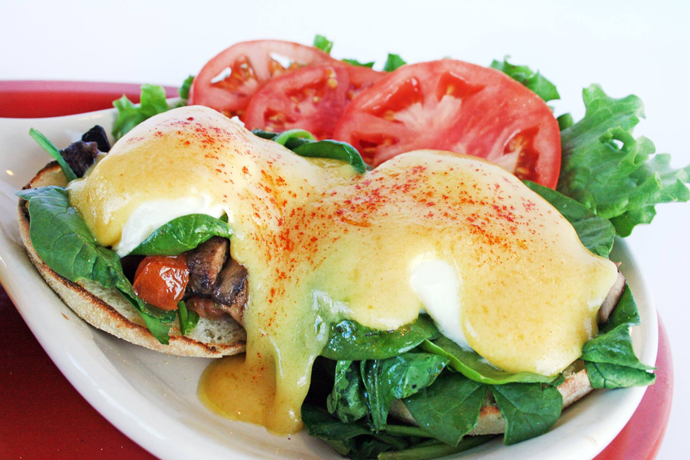 Which restaurant serves your favorite brunch in town?